Ok, so this recipe technically does not involve quorn, but it is vegetarian and I am going to be expanding this blog to include other recipes too. This recipe was actually from the Good Food magazine and it can be found online here. It so happened that I had everything in the house to make it with and seeking a recipe for a light Sunday night dinner it seemed to fit the bill perfectly. One thing I loved about this is that it is rough and ready and quick to prepare, we really enjoyed it - these are classic flavours that work well together and I would likely make this again and probably adapt it, maybe throw some pine nuts in for a bit more texture. 1. 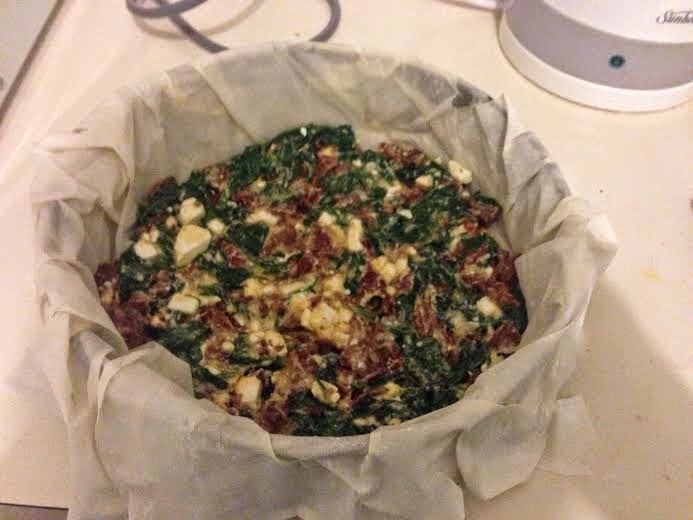 Line a 22cm springform pan with filo - I used the oil from the tomatoes as recommended and brushed it on liberally. I used 4 sheets instead of the 3 in the recipe and staggered them around the pan. 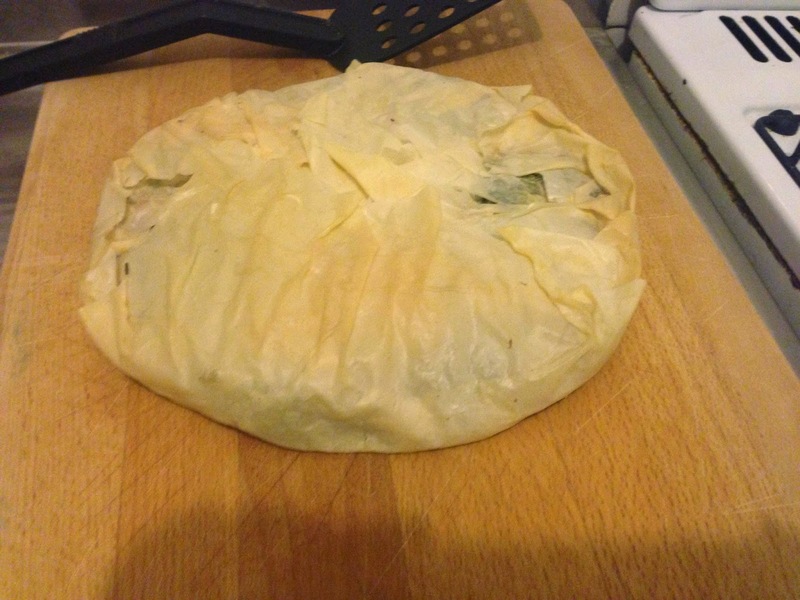 It doesn't matter if you get the odd tear as long as it is covered by the other layers, this is the beauty of filo pastry! 2. Wilt the spinach (I just tipped a kettle full of boiling water over it instead of 'cooking' it - worked perfectly fine!). Drain it - I used a heavy bottomed saucepan to apply pressure to the spinach while it was in the colander draining, it always amazes me the amount of water that comes out. 3. 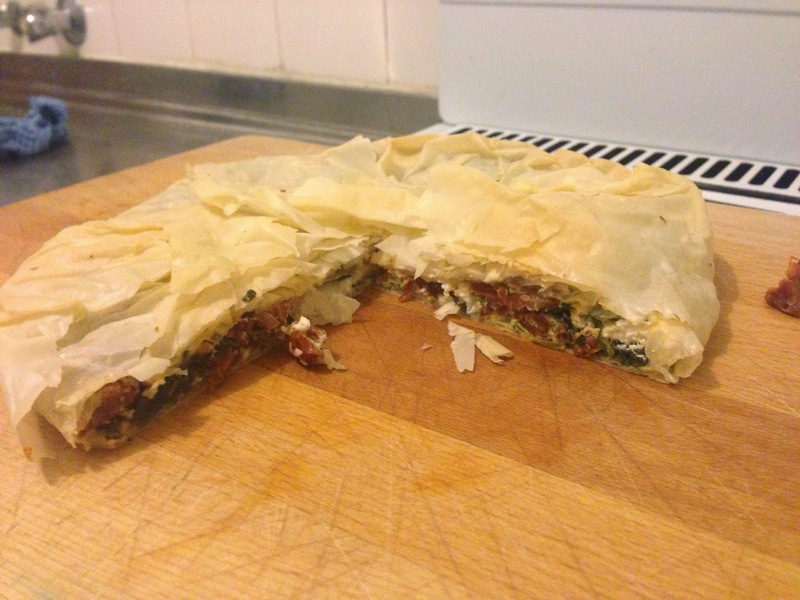 Roughly chop the spinach and tomatoes and chuck in a bowl, crumble over the feta and mix the eggs in thoroughly then pour the mixture into the centre of the prepared pan and fold/scrunch over the pastry. 4. Stick it in the oven (160 gas - see recipe for other temps) for about half an hour until it is golden - to be fair I probably should have left mine in a bit longer but we were hungry and impatient and I could see it was cooked. I really enjoyed this as a light tea, Stu had it with a jacket potato but it was plenty for me on its own. Each portion contains 250 calories and 5g sat fat, the Weightwatchers propoints per portion is 7.